The last 90 days have been a strong Sellers Market, which is defined by the pace of sales compared to the number of homes for sale. It’s that old Supply and Demand idea from Economics 101. In real estate when there is more demand than there is inventory, two things generally happen. 1. Homes sell quickly, occasionally with multiple buyers bidding on the same property and 2. As a result of the higher activity and multiple offers, home values tend to rise. How strong has our market been? From April to the end of June, buyers have been choosing from a low 3.4 average months of inventory. What that means is that if no new homes were to come on the market, we would run out of homes to sell in just less than 100 days. The real estate market is cyclical. Every spring, market activity picks up and remains strong until about the first of July, at which point home sales begin to slow down just a bit. This slow down is gradual and continues until around the end of October when we begin to see a Buyers Market, which is defined as more than 6 months of home inventory. From mid-July to late October, we experience between 4 and 6 months of inventory and this is called a Balanced Market. Homebuyers tend to have an adequate selection of homes to choose from. Sellers are able to sell their home and make their move before winter. Home prices are most stable during this period and both buyers and sellers tend to feel like they are getting a good deal. Home sales have a major impact on the local economy. According to the National Association of REALTORS® research, for every home sold in Iowa in 2014, over $12,000 income is generated in real estate related industries (think appraisers, mortgage lenders, real estate brokers, home inspectors, etc) and an additional $4,400 is spent on consumer items such as furniture, appliances, remodeling, etc. These two figures alone total over $16,000 per sale of economic impact. 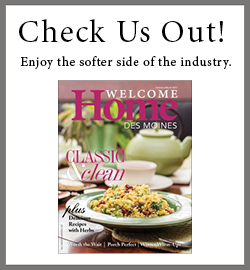 In 2013, there were over 10,000 homes sold in Des Moines and central Iowa alone. We are on track to equal that number in 2014 and this translates to $160 million dollars into our economy.